Applications: EVA foaming, PVC foaming, Rubber foaming, for making plastic plates. 2. HYD. EVA Primary fast-foaming machines. 3. HYD. EVA foaming machines. 5. HYD. Rubber-Plastic tile floor machines. 6. HYD.Wood & Bamboo forming machines. 7. HYD. PVC forming machines. 8. HYD. Rubber foaming machines. 9. HYD. 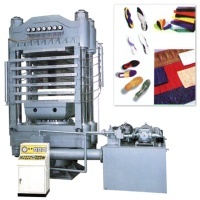 Sports equipments forming machines. 10. HYD. Industrial forming machines. 11. General Industrial Rubber mouldings, Oil Seal, Packing. 12. Copper-clad resing fiber board bakelite laminates. 13. Multi-layer printed circuit board.